As we weren’t long back from France and there was a bit of cider around the house, I cut the first piece into thick slices for James Martin‘s Loin of Pork with Caramelised Apples and Cider. This, however, was a not entirely successful experiment. I cooked the dish during our sunshine-everyday early summer and the sauce was just too rich for a warm evening. The best idea of all arrived a couple of days after we had eaten the last remnants of the pork. This recipe for Cedar Smoked Pork Loin with Pineapple Salsa came via my Clonmel Cousin’s Food Club. The lack of a cedar board was holding me back from trying it out but, aren’t cousins wonderful?, my birthday present from herself and her sister was a whole pack of (wood) smoking fun. Next decent day, barbeque here I come! The other Irish food bloggers who were sent pork came up with some fantastic recipes. If you’re looking for any ideas – or just to make your stomach rumble! – there’s a whole round up on FoodFight.ie. Preheat the oven to 220°C. 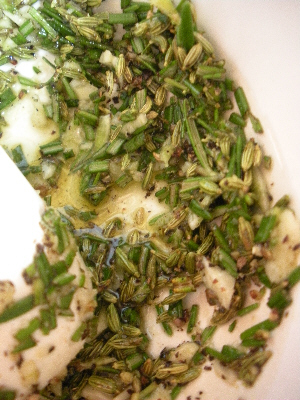 Using a mortar and pestle (or a strong bowl and the end of a rolling pin), grind the fennel seeds, fresh rosemary, garlic and olive oil together with a generous pinch of salt and a good grinding of pepper. Rub this rough paste all over the pork, massaging it in well. Place the onion and apple quarters in a roasting tin, pour in the cider and stock or water, then place the pork on top. Put the tin in the preheated oven, roast for 20 minutes, then lower the temperature to 190°C and cook for another 40 minutes (I allow approximately 25 minutes per 450g) or until the juices run clear. Remove the pork from the roasting tin and allow to rest, tucked up with tin foil, for 10 minutes. Skim off any obvious fat from the cooking juices in the tin. Mash the onion and apple into the remaining liquid, reducing over a high heat if necessary. Serve with mashed potatoes and cabbage, which has been shredded and cooked quickly with bacon and juniper berries. One word for you: Yummy!Can’t wait for next Sunday to try it on! Hope you get to try it out, Liana. It’s yummy when hot but also makes the best leftovers!